District Judge Marie Mallon, presiding over the hearing, said that she was not inclined to accept Modi’s bail plea due the “high value amount” attached to the allegations against him and that he would have “every incentive” to evade surrendering before the court. 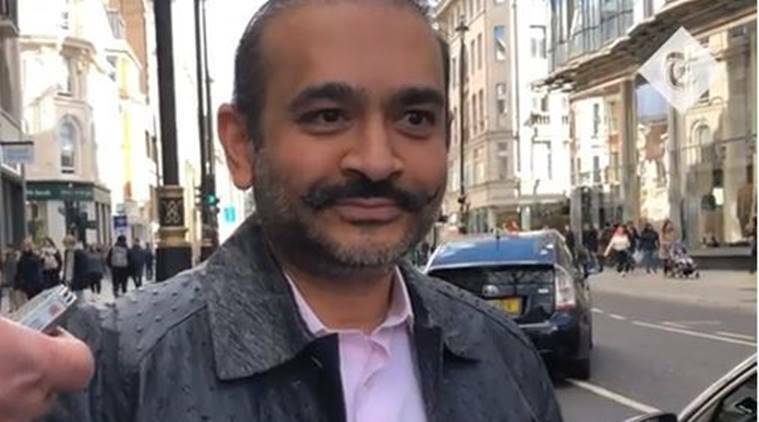 Fugitive diamond jeweller Nirav Modi was arrested in London where a court Wednesday remanded him in custody until March 29 on the ground that he would fail to surrender if granted bail. His arrest comes days after a London court issued an arrest warrant against him in response to a request by the Enforcement Directorate for his extradition in connection with the Rs 13,500-crore Punjab National Bank fraud case. In a statement, the London Metropolitan Police said: “Nirav Deepak Modi, 48, was arrested on behalf of the Indian Authorities on Tuesday in Holborn.” Later, he was produced before the Westminster Magistrates’ Court Wednesday, where he contested his extradition to India and Modi’s team made their case for bail, offering 500,000 pounds as security and an offer to adhere to “stringent” conditions. With elections approaching, the government is likely to use Nirav Modi’s arrest to blunt Opposition criticism that he fled the country on BJP’s watch. However, in Mallya’s case, it took several months to complete the proceedings — his extradition is still pending. Modi’s extradition is likely to follow a similar procedure and the CBI and ED probe will have to stand the scrutiny of UK courts. According to PTI, District Judge Marie Mallon, presiding over the hearing, said that she was not inclined to accept Modi’s bail plea due the “high value amount” attached to the allegations against him and that he would have “every incentive” to evade surrendering before the court. Earlier, the UK daily The Telegraph reported that Modi lives in an £8 million three-bedroom flat in London’s West End runs a new diamond business run from an office in Soho. Explained | What does Nirav Modi’s arrest mean? A senior ED official said: “We have received confirmation from the Scotland Yard police that Modi has been arrested. He will be produced before the court hearing our extradition plea today.” Ministry of External Affairs (MEA) Spokesperson Raveesh Kumar said India continues to follow this matter with the UK to extradite Modi. “We welcome the fact that Nirav Modi has been arrested by the United Kingdom authorities pursuant to the arrest warrant issued by the Westminster Magistrate Court,” he said. Sources said the ED will also send a team to the UK soon to help the Crown Prosecution Service, which will argue the case on behalf of India, get a favourable order. PTI also reported that the CPS told the court that Modi was wanted in India for fraud and money laundering amounting to the tune of $2 billion. Under UK domestic law, the CPS said he is liable on charges of conspiracy to fraud and conspiracy to conceal. “We do object to bail because there are substantial grounds to believe the requested person (Modi) would fail to surrender,” said Barrister Jonathan Swain, appearing for the CPS. Modi’s legal team was headed by Barrister George Hepburne-Scott and his solicitor, Anand Doobay, is the same legal expert hired by liquor baron Vijay Mallya in his extradition proceedings against India. Modi along with his uncle Mehul Choksi allegedly siphoned off Rs 13,500 crore from PNB through fraudulent of Letters of Undertaking (LoUs) and Letters of Credit. ED and CBI investigations have found that Modi diverted a large part of these funds to family members and for personal purposes. Modi’s case will likely mirror that of Mallya, who is out on bail since he was arrested on an extradition warrant in 2017. Once the extradition hearing begins, the courts will decide whether the offences Modi is charged are punishable in the UK as well. It will also look into whether the extradition will in any way violate Modi’s human rights. If it approves extradition, the courts will send the order to the Home Office for confirmation by UK Home Secretary Sajid Javid. The court order can be challenged and with no appeal, Modi will have to be extradited in 28 days. If the order is confirmed even during the appeal, the final decision will still rest with Javid to send Modi to India. Mallya’s extradition is presently pending at this stage. Meanwhile, a Mumbai court has issued a non-bailable warrant against Modi’s wife Amy whose last known location was in the US. Amy is also an accused in the PNB scam case with Modi. The court has also allowed the Income Tax Department to auction 68 paintings owned by Modi after the ED gave a no objection certificate to the process.